The mass exodus of Muslims from the Central African Republic (CAR) amid insecurity is having an adverse impact on access to basic foodstuffs, say retailers and local people. Basic consumer products such as salt, soap, sugar, milk and cooking oil, as well as farm produce, including onions and tomatoes, have become scarce or are too expensive for ordinary people. In Bangui, for example, the cost of a bar of soap has risen since late 2013 to 250 CFA (53 US cents) from 150 CFA. Rice, beans and groundnuts have also gone up sharply. Epiphanie, a housewife living in Bangui’s eighth district, is a regular shopper at Gobongo market. “I am really overwhelmed by the situation. The price of everything has gone up. A litre of cooking oil that we bought at about 900 CFA [$1.90] a few months ago, today costs 1, 400 CFA [$2.95]; a pile of onions that cost 250 CFA is now 500 CFA [$1.05],” she told IRIN. Tens of thousands of Muslims have fled their homes in CAR, often to neighbouring countries, amid attacks by militia who associate all Muslims with a rebellion that held power for several months after staging a coup in March 2013. “The departure of Muslim businessmen who managed most of the trade and transport activities has severely affected the availability of food. Commerce and transport sectors are currently a fraction of their pre-crisis levels,” states a 7 April UN Food and Agriculture Organization (FAO) and World Food Programme (WFP) special report. “Imports from neighbouring countries declined by 25.7 percent in 2013 and the movement of locally produced food commodities from surplus producing areas to deficit areas was severely restricted,” it adds. Commodities such as eggs and beef have become hard to find. According to the FAO/WFP report, the price of meat is also well above 2013 levels. 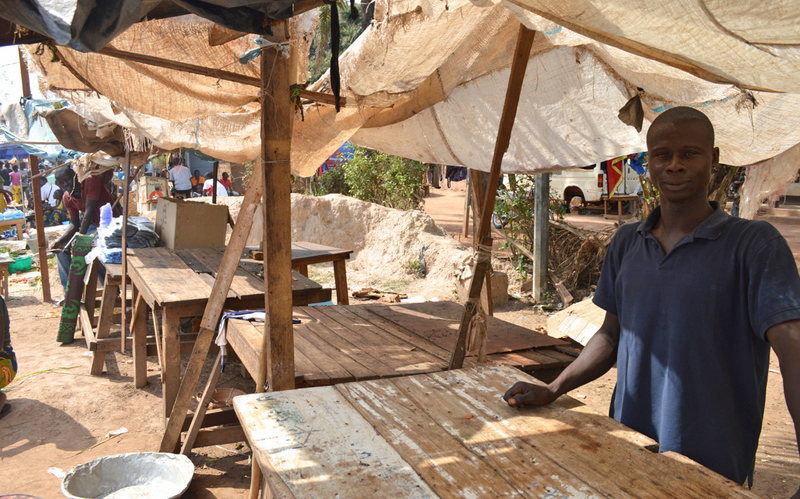 Butcher stall in Bangui, Central African Republic. Edgar, outside Eglise des Freres Castor, showing his empty butcher stall. Meat is hard to find in Bangui, as herders have fled to the bush. Butchers also have to deal with harassment from the anti-balaka. “The anti-balakas require us to pay 40,000 to 50,000 CFA [$84.32-105.4] per cow as slaughter tax. This is one reason for the speculation in the meat price in the capital’s markets," he added. Many Muslim Peuhl (Fulani) herders, who supplied butchers’ shops in the past, have fled due to insecurity. A lack of disposable income, due to the irregular payment of civil servants’ salaries, is a problem. “The problem is that we don’t have enough money… because our husbands are not paid,” said Jeanne, a housewife. The irregular payment of salaries for civil servants has left them in a dire situation. “We are suffering. They do not pay us regularly and we are riddled in debt. Today, we are five months in salary arrears. We have virtually no money to feed our families. We are stuck in a rut,” Valentin Mounou, who works in the Education Ministry, told IRIN. According to Lambert Yeremon, an economics professor at the University of Bangui, the general state of insecurity in Bangui since December 2013, when the city experienced a surge in violence, is the main challenge. More than 2,000 people were killed in the conflict between Seleka and anti-balaka fighters since December 2013, according to a UN Refugee Agency (UNHCR) 1 April briefing. Renewed inter-communal violence in Bangui has forced more people to flee within the country and across its borders. “Since the attacks in the capital early last week, the number of internally displaced people in CAR has risen to 637,000, including 207,000 in Bangui alone. This represents an increase of nearly 16,000 uprooted people,” says the UNHCR briefing. CAR has been in the grip of a humanitarian crisis since the ouster of the government by the mainly Muslim rebel Séléka coalition.